You may think you’re not very resilient. If you’re thinking any of this, then you are probably one of the most resilient people. You have suffered, you have struggled, you have waded through a seemingly unstoppable tide of difficulty – and you have survived. We tend to think of resilient people as those who are unaffected by the challenges of life, who take a setback with a smile and laugh in the face of their obstacles. But this is not resilience. Resilience is not the absence of distress or difficulty. Resilience is the ability to adapt and grow following adversity. The person who feels no emotional distress when difficulty arises is not displaying resilience. The person who fails miserably feels intense negative emotions and survives to try another day is displaying resilience. Put simply, resilience is the ability to adapt when faced with difficulty, trauma, or tragedy. We all demonstrate resilience throughout our lives. While some people may be more resilient than others, resilience is not an immutable trait or characteristic that you either have or don’t have. Resilience is a learned ability, one that can be learned and built and developed by anyone. If you still don’t believe you’re very resilient, the good news is that there are ways to continue building on your resilience. Some of these resilience activities and exercises may help you develop your resilience, and some may make you realize how resilient you already are. Either way, the outcome is more confidence in your ability to bounce back. 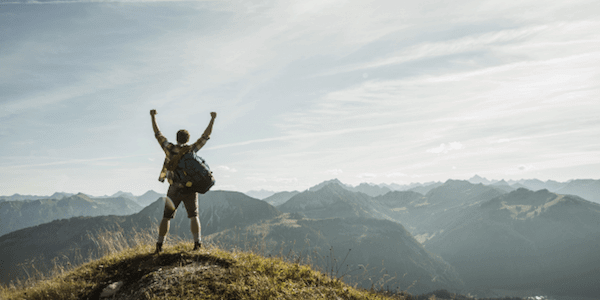 Read on if you’re ready to learn more about how to boost your resilience and meet challenges with confidence in yourself and your ability to succeed, even after failure. We’ll provide several resources for building resilience, but first, let’s take a look at what the American Psychological Association has to say about building resilience. Making connections and building your social support network. Avoiding the tendency to view crises as insurmountable challenges. Accepting that change is a natural and unavoidable part of life. Moving towards your (realistic) goals. Taking decisive actions that will help you face your challenges. Looking for opportunities for self-discovery. Nurturing a positive view of yourself and your abilities. Keeping things in perspective and in context. Maintaining a hopeful outlook on life. Taking care of yourself (APA, “10 Ways”). 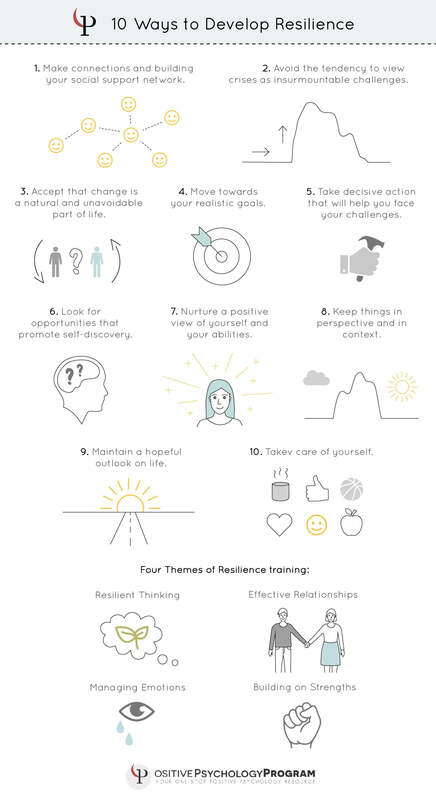 These ten basic principles of improving resilience can be applied on your own, in a guided therapeutic relationship, or in training and courses on resilience. The training aims to help participants learn better ways to interpret events, which can have a significant impact on how they react to them. Relationships and social support are key to developing resilience and adapting to change. Emotions are a normal part of life, even the intense or negative emotions, and learning how to manage and regulate them is an important piece of resilience. Identifying and building on our strengths is an excellent way to build resilience and be our best selves. This training is built on the idea that only resilient adults can truly facilitate resilience building in children and young adults. That’s why their first focus is only helping adults become more resilient before teaching them to build resilience in others. To learn more about How To Thrive’s resilience training, click here. This program is intended for teenagers and adults over the age of 16. 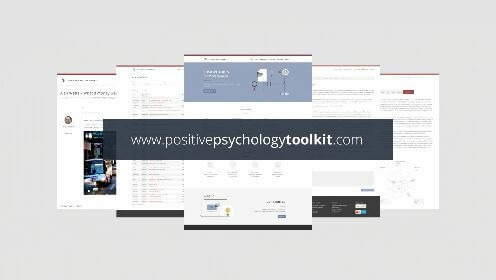 It is offered online and is especially helpful for older students dealing with stress or pressure from school, family, and upcoming transitions. This course is delivered through five sessions of 2 to 2.5 hours and guided by a facilitator. Click here to learn more about this training endorsed by the World Health Organization. The Samaritans organization provides training for adults who want to build their resilience in the Building Resilience and Wellbeing course. Explore the connection between emotional health and resilience, and understand how resilience can positively impact our lives. Assess their own resilience skills. Recognize the indicators of stress and identify sources of support. Learn the Keys of Resilience, the knowledge, behaviors, and skills that can enhance resilience. Identify practical steps they can take to build resilience. Build a personalized action plan. The course generally takes place over one day and can be delivered at locations throughout the UK. If you’re a parent, coach, therapist, or other mental health professional interested in a more structured approach to helping clients or children build resilience, the Reaching In Reaching Out Resiliency Skills Training program can help. 1) Identifying and strengthening resilience abilities. 3) Recognizing how thoughts can affect the ability to cope. 4) Challenging thinking patterns that hinder resilience. 5) Generating alternative ways to deal with conflict and stress. 1) Modeling the skills and fostering resilience in children. 3) Incorporating resiliency skills into their work by using child-friendly approaches. This training can be completed in two full days, four half-days, six after-work sessions, or 10-12 brief sessions. To access the RIRO skills training, click here. There are many resources out there to help students and youth build resilience, including worksheets that they can work through on their own or with the guidance of a trusted adult. A few of these worksheets are listed below. This worksheet can be found on pages 25-26 of the PDF on resilience training for children. Click here to access the PDF. The goal of this worksheet is to help students and children explore their feelings through color. 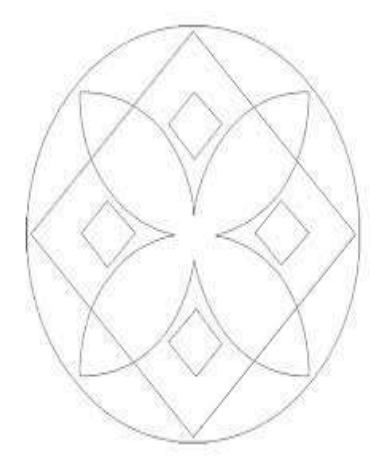 The instructions can be found on page 25 and the Mandala can be found on page 26. The instructions are simple: have the students color in each area of the Mandala in a way that represents how they feel about that area of their life. They can use a variety of colors or just one color, however best represents their feelings. After they have colored each section in, discuss the color(s) with them. Use active listening to learn about why they chose the color or colors they used. This worksheet can help students discover and express their own feelings, as well as help parents or teachers, learn about how the student or child is doing with each area of their life. Before issues can be addressed and learned from, they must first be discussed. This worksheet can be found in the same PDF as the Mandala Session, on pages 27-29. Click here to access the PDF. Completing this exercise can help children and students recognize and appreciate the gifts and qualities they have. Begin by explaining that this exercise will focus on who you are inside. There is also space at the end of this page to write down a few qualities or characteristics not already listed, so encourage students to be creative if they think some of their good qualities are missing. The second step is for students to share these gifts and qualities that they chose. Students should describe why they chose each gift or quality and give examples of how these qualities fit them. 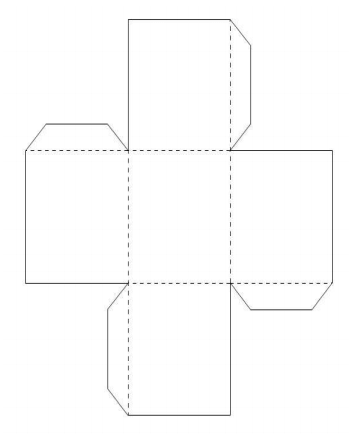 Step three is to give students the gift box cutout on page 28. Have them cut along the dotted lines and arrange the box, then decorate it with their name, their favorite color(s), or any of the craft items they would like to use. On page 39 of the same PDF, there is a worksheet called “Reviewing My Work” that can help students think realistically about how they did on a particular assignment or task and learn how to improve in the future. Click here to access the PDF. In order to develop resilience, it’s important to be realistic about setting and striving towards goals, learning from one’s mistakes, and trying again. This worksheet presents nine dichotomous pairs of statements with a scale in between. The student should be instructed to indicate on the scale how they feel in regards to these two opposite statements. Use the students’ responses on this worksheet to help them discover where they are satisfied with their work and where they could devote more attention. Encourage them to do better next time, and emphasize that their performance is always a work in progress. If they feel they have failed themselves or their teacher, help them to see that failure is a normal part of life and it is not the end of the world. This simply named worksheet can help students learn to develop hope and build resiliency. It will guide students through a thought exercise in what hope is, how they tend to think about and experience hope, and how to facilitate greater hope in their lives. What happened in your life that caused you to stop hoping? Where do you believe your sources of hope, or lack of hope, come from? How has your environment affected the amount of hope you currently have? Where do you look for hope in your life? What are three things you hope for? How have your hopes changed as you have grown up? How has hope, or a lack of hope, affected decisions you have made? What needs to happen before you have more hope in your life? You can find this worksheet here on pages 13-14 of this PDF. Primary or elementary school is an excellent time to begin building resilience. Children are so adaptable already that introducing the idea of resilience is much easier than teaching resilience to adults. There are many resources out there for helping build resilience in young children, but games are certainly one of the best ways. Listed below are some of the best games for teaching resilience in primary or elementary school. This is a great game for helping foster kindness in children. Kindness is important on its own, but learning kindness for others in addition to the self is also vital as a piece of resilience. This game is played with a number of chairs or cones formed into a circle. Make sure there is one less chair or cone than the number of players. As soon as s/he is finished, everyone who this applies to (including the person in the center) moves from their chair or cone to an empty one that is not right next to them. The person who remains in the middle begins a second round of the game. You can read about this game and its other variations here. This game can be played with only several pairs of children and some space. If there is an odd number of children, you can play with them to make an even number. To play, separate students into pairs of two and designate one of them student A and the other student B. Instruct student A to listen to student B for a specified amount of time, perhaps 15 seconds for very young children or a minute for older children. Instruct student B to finish the sentence “If you really knew me, you would know that…” They can finish this sentence with any information about themselves, whether it’s their family structure, the classes they like best in school, their hobbies, their pets, they favorite or least favorite things or anything else they’d like to share. Student B repeats this sentence several times, completing it with a new piece of information each time. When the time is up, have students A and B switch roles, so A speaks while B listens. This game is another good way for students to get to know each other and to practice active listening. It may even help strike up a few friendships! Having meaningful relationships and practicing kindness is a great way to build resilience. Switch is played with a four-square court or four cones forming a square with an additional cone in the middle. Review rock-paper-scissors with the children before you begin. Five players can play at a time, with each player occupying either a corner or the middle. All other children should be in a line, ready to play when their turn comes. At this point, all players must find a new corner or cone to occupy, but no one can go to the center cone. The next person in line becomes the person in the middle and begins the next round. This game helps children learn how to deal with conflict. Meaningful connections are vital to developing resilience, but conflict arises in all relationships at some point. While most conflicts cannot be solved with only “rock-paper-scissors,” this teaches children that conflict can be solved. Although they may be disappointed by being “out” of the game, they will quickly learn that, in life as in the game, their turn will come again. You can read about this game and its other variations at this link. This game is played in a circle, with all children holding hands. First, demonstrate how to get your body through a hula hoop without using your hands. Make sure that each child has a space in the circle. 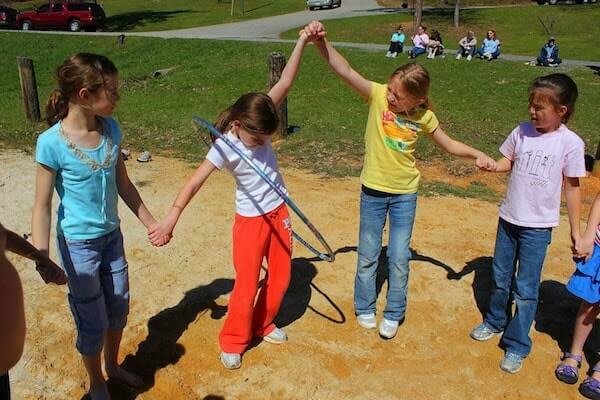 Place the hula hoop over two people’s interlocked hands so it cannot escape the circle. Tell the children that the goal of the game is to get the hula hoop all the way around the circle without anyone letting go of their neighbors’ hands. Start the game, and have everyone cheer on the children that are currently trying to move the hula hoop. Once the game has been played for one round, discuss the group’s successes and challenges and try it again. This game is a great way to show children that when conflict or challenges arise, there are ways to deal with them. Even if they face seemingly insurmountable challenges, together they can find a way to overcome them. Variations on this game include challenging the group to beat a chosen time, playing with eyes shut, or dividing the circle into two circles and having them compete against each other. To see more about this game, click here. If you’re interested in more resilience-building games for primary and elementary school, click here. There are many resources for developing resilience in adults aside from courses. For example, there are several exercises that can help build resiliency skills. A few of these exercises are listed below. This is an exercise for rating your current exercise. While this may not build your resilience directly, it can help you to learn about your current resiliency skills and abilities. In order to increase your resilience, it’s important to know what aspects of resilience you most need to work on. Support from other people in your life. Ability to accept yourself for who you really are. Your confidence in your ability to cope with adversity. How good you are at communicating and interacting with others in times of stress. 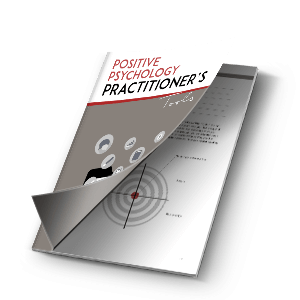 How good you are at facing challenging problems in life and solving them systematically. Ability to cope with your emotions in the face of adversity. In part two, you add up your total score and review your ratings on each element. If you rated any elements above zero, think about what made you give it a rating above zero and what you could do to get the score closer to 10. Doing this exercise will help you to recognize where you are in terms of resilience and identify where you can improve from your current state of resilience. This exercise focuses on your past experiences with resilience. Start by thinking about a time in your life that was particularly challenging or demanding, especially one that was emotionally draining or difficult emotionally. Think about how you handled that situation and eventually came through on the other side. What unpleasant feelings and thoughts do you remember having in the situation? Who, if anyone, did you receive external help and support from? What specific attitudes and skills helped you cope with the situation? How would you rate your resilience in that situation? What strengths and personal qualities helped you? If it wasn’t 100%, how could your resilience be improved during similar situations in the future? Based on your experience how might you advise someone else to cope with a similar situation in the future? Going through this exercise and answering these questions will help you to realize the resilience skills you already possess, which can aid you in further building on those skills. Use this exercise to remind yourself that you have already practiced resilience many times before and that you are fully capable of handling whatever comes your way. This exercise can help you set goals on improving your resiliency and making sure you keep your resilience-building on track. First, identify the most important values and areas of your life to work on and behaviors that may be working against your resiliency building goals. Next, identify some long-term goals for these values and areas, then set some short-term goals that can help you work towards your long-term goals, and finally write some first steps that will set you on your way. Resilience is like many other skills or abilities, in that you cannot put forth effort once and consider your learning done. To truly build meaningful resilience, it must be a practice rather than a crash course. Use this goal-setting exercise to facilitate your goal striving. All of these exercises can be found here if you’d like to read about them in more detail. The best way to deal with the things that scare you or are emotionally difficult is to face them. Facing them can help you see that you can meet any challenges that present themselves to you, and build your confidence in your abilities. If you’re scared of public speaking, sign up for a public speaking course or a group that regularly practices speeches like Toastmasters. If you’re afraid of small talk, sign up for speed dating, whether it’s “speed dating” for making platonic friendships or for romantic relationships. If you’re afraid of flying, book a flight to a fun vacation. Facing your fears is the best way to grow. Make sure to reward yourself for overcoming your fear afterward! This is an exercise that you can use for yourself or guide your clients through when they are feeling down or excessively worried. “Three Ways” refers to thinking about three ways that their situation could be worse, specifically for yourself or your client (Tyrrell, “A Quick Therapeutic Exercise”). For example, if a friend flaked on your plans, you might feel upset or disappointed, which could lead to feeling abandoned or even to feelings of worthlessness. Instead of focusing on what happened in this situation, think about three ways that it could be worse. Spend a few minutes truly imagining each scenario. Think about what you would see, hear, and physically feel in each scenario. It may seem counterintuitive to imagine things being worse, but thinking through these three ways can actually remind you of what you already have and instill gratitude for the good things in your life. As mentioned earlier, school is an excellent place to begin building resilience. While parents can and should help their children develop resilience, a classroom setting with their peers and a qualified teacher guiding the way can be an excellent place to learn. A few resources for resilience lesson planning are noted below. Elementary or primary school is an excellent time to begin teaching resilience to children. The earlier children begin building resilience, the more likely it is to “stick.” However, resilience is not something that can only be built in young children; children in middle school can also benefit greatly from resilience building. The PDF from Lynne Namka and Talk, Trust, and Feel Therapeutics in Tucson, Arizona is an excellent source for lesson plans for young students. To access the PDF click here. It covers teaching a growth mindset, stress inoculation, giving effective praise, helping children deal with emotional trauma, and “bouncing back” after a setback. There are tons of exercises, tools, and lesson plans in this PDF that teachers can use to help young students develop resilience. Another great resource for lesson plans and suggestions for resilience building in young children comes from Professor Helen McGrath’s Bounce Back! program. B – Bad times don’t last, and things get better. O – Other people can only help if you share with them. U – Unhelpful thinking only makes you feel worse. N – Nobody is perfect – not you, not your friends, not your family, not anybody! C – Concentrate on the good things in life, no matter how small. E – Everybody suffers, everybody feels pain and experiences setbacks; they are a normal part of life. B – Blame fairly – negative events are often a combination of things you did, things others did, and plain bad luck. A – Accept what you can’t change and try to change what you can. C – Catastrophizing makes things worse – don’t fall prey to believing in the worst interpretation. K – Keep things in perspective. Even the worst moment is but one moment in life. You can access a slideshow on the Bounce Back! program here to learn how to apply McGrath’s resilience building principles and activities to each of these areas. Additionally, the PDF from Connect with Kids provides a lesson plan for children in grades 3 to 5 called “Resilient Voices”. It can be found on page 6 and guides students through listing problems they face in their lives, defining resilience, and building a foundation for resilience. To access the PDF click here. Another lesson plan that can help students develop resilience can be found in the previous PDF on page 8 or in the PDF from Connect With Kids and the Drug Abuse Prevention Program in New York. To access the PDF click here. There is some great information throughout this PDF, but you can skip to page 4 to see the Resilient Heroes lesson plan. While it’s best to begin early, high school is still a time that is ripe for building foundational skills like resilience. High school teachers should not be discouraged from incorporating resilience exercises and activities into their lesson plans, as high school students may be one of the groups that need resilience the most! Exercises and activities are provided for each element, with tips for implementing resilience building and encouraging students along the way. This lesson plan will help students learn about the Seven Resiliencies (insight, independence, relationships, initiative, creativity, humor, and morality) and explore the life of a historical hero, as well as apply the Seven Resiliencies to their own life. Aside from the benefits and advantages we know resilience can bring, there is another type of resilience that can greatly enhance the quality of life. The Shame Resilience Theory was developed by author and researcher Brené Brown. Brown noticed that the fear of being vulnerable hindered meaningful connection with others, and one of the many reasons we fear vulnerability is the feeling of shame. Shame is an intense and negative feeling of being hopelessly flawed and unworthy of love and acceptance, and it affects all of us at one point or another, but it can be especially gripping for some people. Shame resilience is a specific kind of resilience to this intensely negative feeling, and building it can do wonderful things for our self-confidence, empathy, and human connection. 1) Recognizing shame and understanding our shame triggers (physical sensations like elevated heart rate or shaking). 2) Practicing critical awareness, of ourselves and of our environment and the way things work. 3)n Reaching out to others and sharing ourselves and our stories (building a social support network). 4) Speaking shame to keep it from flying under the radar (Graham & Graham, 2015). When we recognize shame and understand our triggers, practice critical awareness, share with others, and keep shame out in the open, we lay the groundwork for a type of resilience that will greatly improve our connections with others, our self-esteem, and our overall well-being. There are a few exercises that can be especially helpful for building shame resilience. A few of these are listed below, but many more are out there if you’re interested in learning more. 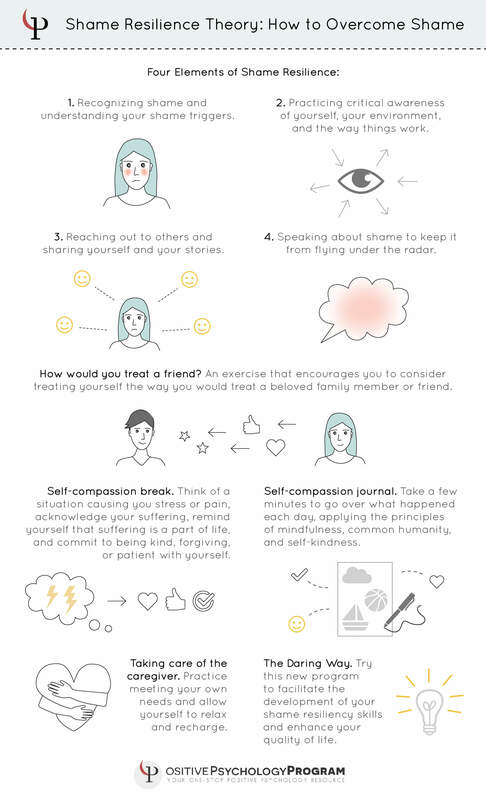 Developing self-compassion can be an excellent way to combat shame and build resilience to its effects. Dr. Kristin Neff is the pioneer of self-compassion research, and her website offers several guided meditations and exercises to increase compassion for the self. For example, a simple exercise that can set you on the right path is “How would you treat a friend?” This is a quick and easy exercise that anyone can do. All you need is a piece of paper, a pen, and a willingness to answer honestly. First, think about the times when a close friend feels really bad about him or herself or is really struggling in some way. How would you respond to your friend in this situation (especially when you’re at your best)? Please write down what you typically do, what you say, and note the tone in which you typically talk to your friends. Now think about the times when you feel bad about yourself or are struggling. How do you typically respond to yourself in these situations? Please write down what you typically do, what you say, and note the tone in which you talk to yourself. Did you notice a difference? If so, ask yourself why. What factors or fears come into play that leads you to treat yourself and others so differently? Finally, respond to this prompt: Please write down how you think things might change if you responded to yourself in the same way you typically respond to a close friend when you’re suffering. To see this exercise on Dr. Neff’s self-compassion website, click here. To practice the self-compassion break, you must first call to mind a situation in your life that is causing you stress or pain. Think about this situation and how it makes you feel, both emotionally and physically. “This is a moment of suffering.” This will activate mindfulness. “Suffering is a part of life.” Saying this helps you realize that you have this in common with all other human beings on the planet – suffering is an unavoidable part of life. You can follow this up by putting your hands over your heart or using whatever soothing self-touch feels right to you. To see this exercise on the website, click here. This exercise will feel familiar to anyone who has tried journaling before. Keeping a general journal or a gratitude journal can help you express your emotions, recognize the good things in your life, and keep a positive outlook on life. Keeping a self-compassion journal gives you a chance to exercise mindfulness and keep in touch with yourself in a kind and compassionate way. All you need to start journaling is a journal, a writing instrument, and a willingness to write honestly. At the end of each day, take a few minutes to go over what happened, especially events that made you feel bad about yourself or judge yourself. Bring your awareness to the painful emotions that came up. Write about not only what happened, but how it made you feel. Avoid being judgmental of yourself or being overly dramatic about what happened, and practice acceptance of yourself and your actions. When you journal, make sure to write down how your experience connects to the larger “human experience.” Acknowledge that we are all imperfect, we all make mistakes, and we all feel pain. Keep in mind the factors that exacerbated your response to this particular event. When you write, write with understanding and kindness to yourself. Treat yourself like a beloved family member or dear friend, and give yourself the encouragement and love that you would give to them. Use a gentle tone and reassure yourself of your goodness. If you keep a self-compassion journal and stick to these three principles, you will build your abilities to keep your thought and emotions organized and increase the depth of your compassion for yourself. This exercise can be found here on the self-compassion website. This exercise is intended specifically for those in a healthcare profession or those who take care of a family member. People who spend so much time providing care for others often have a greater need for self-compassion and self-care. The beautiful thing about this exercise is that you can practice it, however, works best for you – the only requirement is that you do something for yourself that will meet your needs and help you recharge. This could be getting a massage, taking a long and leisurely walk, going to a yoga class, or spending time relaxing and doing nothing at all. If you just can’t find the time to do any of these in a specific moment of need, practice “on the job” self-care. When you’re feeling overly stressed or overwhelmed in your caregiving, use soothing words or touch, or take a quick self-compassion break. Only you know what will work for you in the moment, but above all, you need to give yourself permission to be human, with all of the flaws and pain that come with being human. To read more about taking care of the caregiver, click here. This isn’t so much an exercise as it is a program, one that requires committing time and energy in order to engage and reap the benefits. The Daring Way is an experiential methodology, facilitated by certified professionals and appropriate for individuals, couples, families, teams, and organizational leaders. The focus of this training is on helping people build shame resiliency skills and become braver, more vulnerable individuals who accept their worthiness and live a fuller, more authentic life. To learn more about The Daring Way, visit thedaringway.com. This article covered several ways to help build resilience in adults, young adults, adolescents, and young children. There are many more ways to build resilience, so don’t feel constrained to these resilience activities. I hope you find these exercises useful. Please leave us a comment below if you give any of these exercises or lesson plans a try and let us know how it went. Thanks for reading, and happy resilience building! Awesome article. I’ll find it really useful for children in my sphere of influence. God bless you real good. Thank you for this wonderful resource! I can’t wait to start using it. omg!!!!!! this is brilliant resource I will be using it in the next 15mins, can’t wait-its just perfect THANKYOU SO MUCH!!! have a fab day 🙂 !!!!!!! Very helpful in that this article goes beyond explanation and into practical application. Thank you so much! Enjoyed the material and will continue to utilize the site. These are great articles and suggested activities to start a new resilience program at my school. Our school is challenged to address and rehabilitate trouble some city students. There is a need to have such program to personalize student of their strengthens and weaknesses and to give a sense of positive self esteem and hope. Wow this is amazing. The resources are top notch. Thanks so much. Thank you! Great article and materials! Thank you for this fantatisc and pratical summary! This is such a great read, the fact that it available to all free of cost is greater joy. Thanks a lot.